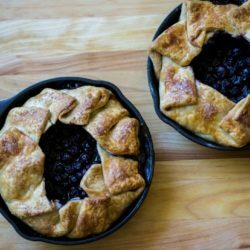 My family enjoyed my Cast Iron Fresh Peach Galette so much last week I decided to make a Cast Iron Fresh Blueberry Galette this week. It was equally as delicious and even easier this time. Why? I decided to use the ready-made Pillsbury Pie Crust. I don’t mind making my own pie crust, in fact it’s actually quite simple. However, sometimes I’m just not in the mood. What was ideal about the Pillsbury Pie Crust was literally all I did was remove it from the package, unrolled it, and placed it in my Lodge 6 1/2-inch cast iron skillet. I mean what could be easier? I did snip a little of the sides off with my kitchen scissors so the dough wouldn’t cover the blueberries too much. Part of making a galette is so it has that rustic look – not perfect, which is what I love about it. I’m a huge fan of blueberries and literally have them every single morning in my oatmeal with plain cinnamon and almonds. I can’t seem to get enough of them. Are you aware of the power these little berries provide your body when eaten? Ongoing research is being done in these last 4 areas listed above. As I mentioned in my previous post for my Cast Iron Fresh Peach Galette, this recipe is super simple to create. 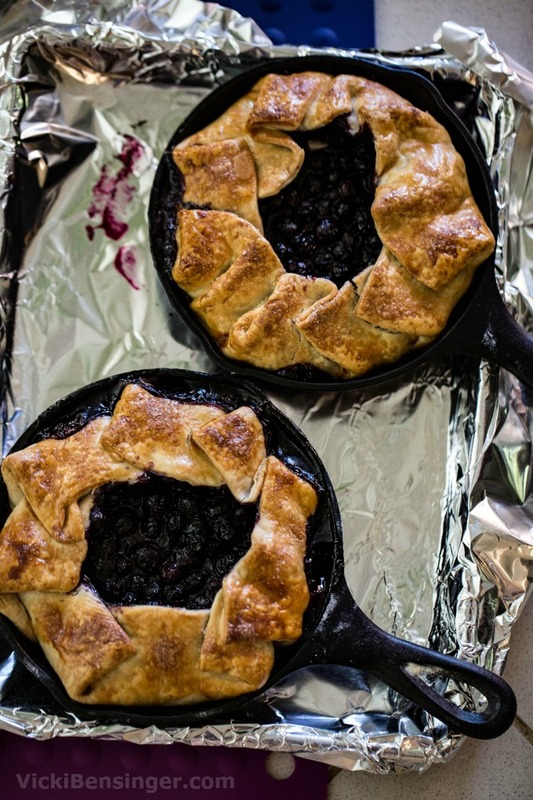 If you don’t have two Lodge 6 1/2-inch cast iron skillets then you could use a pie plate, tart pan, any oven proof bowl, or simply set the dough on a foil lined sheet pan with parchment. Fill the center and bring up the sides. 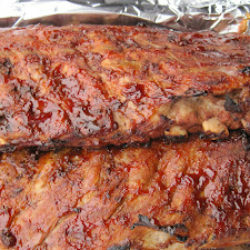 I prefer adding the foil on the bottom since the juices typically will ooze out. This way clean-up is a cinch. No one likes to spend time scraping the pan of burnt fruit. I hope you’ll try my recipe below. If you have any questions please don’t hesitate to message me on my facebook page At Home with Vicki Bensinger, post a comment below, or click the “contact” link above and shoot me a message. I’ll return a response quickly. For a quick holiday weekend dessert, or anytime of year, I hope you’ll try my Cast Iron Fresh Blueberry Galette! 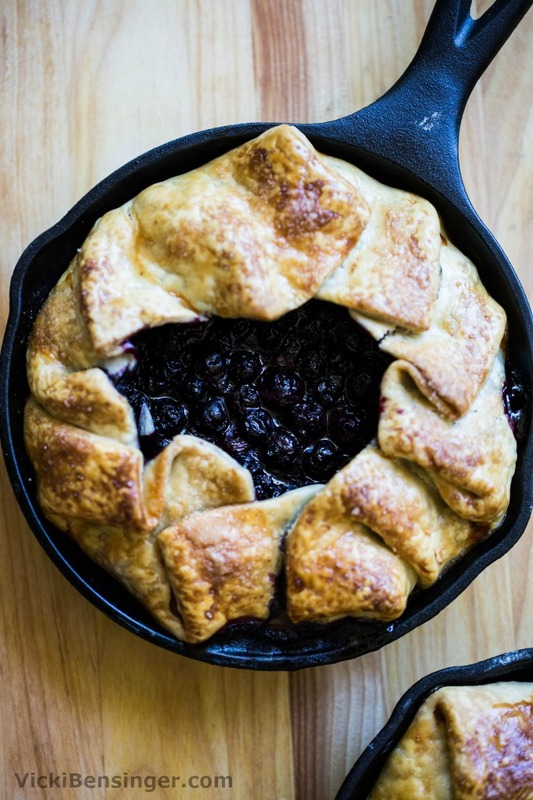 With blueberries in season whip yourself up a skillet of my Cast Iron Fresh Blueberry Galette! It's perfect for tow or use 2 skillets and make it for four. 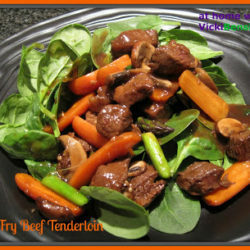 So flavorful and good for you too! Pie Filling: In a medium size bowl, combine all filling ingredients EXCEPT butter and blueberries and blend. Once blended fold in blueberries and set aside. Remove one package of dough from the box and unroll. Center pie crust and place into one cast iron skillet. 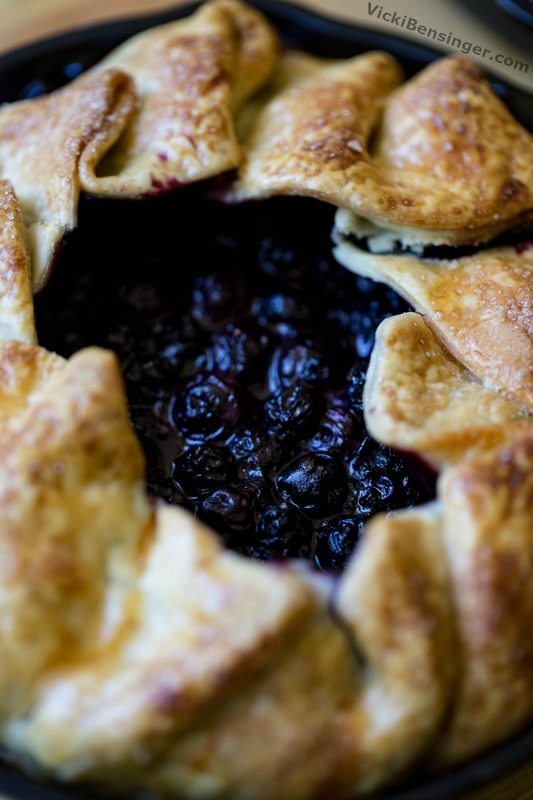 Be sure to have the pie crust set into all the edges at the bottom and sides. Add half the blueberry mixture to a skillet. Fold up the sides of the pie crust. If it covers too much of the berries, using a scissors, snip some of the edges off. Brush egg wash over the top of the pie crust and sprinkle with half of the granulated sugar. Dot exposed blueberries with half of the butter. Set filled cast iron skillet onto a foil lined sheet pan. Repeat steps above with second cast iron skillet. 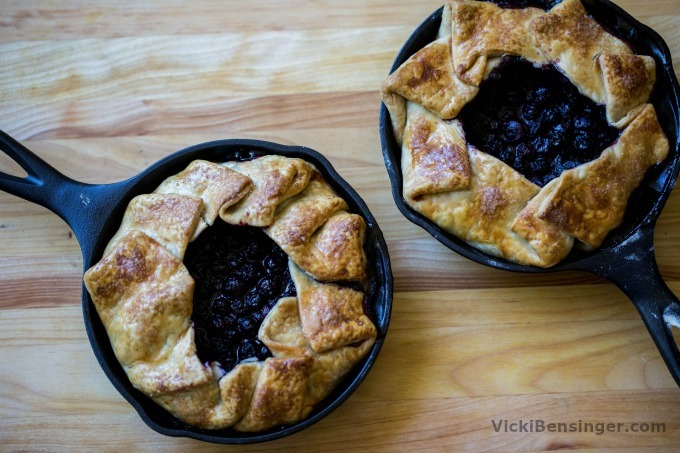 Place skillets into the oven on the center rack and bake for approximately 50-60 minutes or until the crust is golden brown and blueberry filling is bubbling. Remove from oven and cool for at least 2 hours. Serve at room temperature, plain or topped with vanilla ice cream. Hungry for more? Savor these? I love your shortcut! I never would have guessed as it looks completely homemade! Nice to make it easy on the cook. I eat blueberries almost every day, too. It would be nice to end my day with some, too 🙂 Hope you have a terrific holiday weekend, Vicki! Thanks Liz. Not sure how I missed your comment. I love doing shortcuts especially when the taste doesn’t suffer. This was so good. I hope you’ll try it. Have absolutely no problem with store bought pastries. 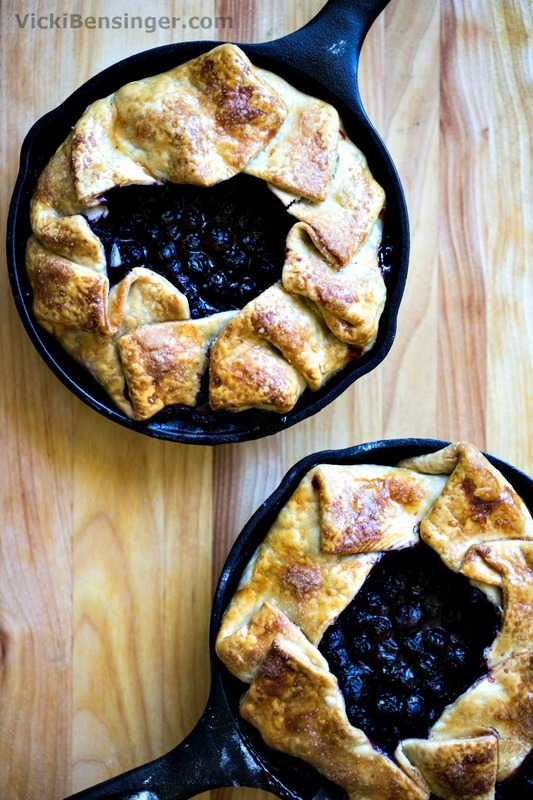 These galette look so inviting with blueberries. They’re so good but be warned your teeth will be purple. 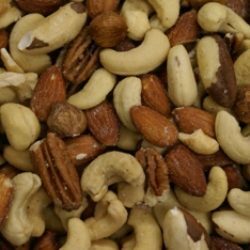 So brushing is a good idea to follow up with after indulging! Love blueberries, love galettes. So you know where I’m going with this — I’d definitely love this! Thanks. Same here and these were so flavorful! Hope you give them a try. 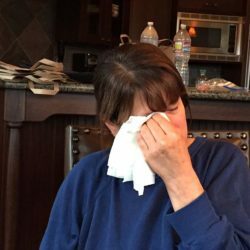 You have a great thing going here Vicki. My favorite kind of dessert- served warm with a scoop of vanilla ice cream! I agree. I love doing these in small cast iron skillets. They’re just enough for 2 or 1 with leftovers, unless you’re super hungry. Plus they couldn’t be easier to create and definitely perfect with a scoop of vanilla ice cream! I love those Pillsbury pie crust. Use them all of the time. Love the look of this blueberry galatte. Quite lovely.